The first mall in Minneapolis? 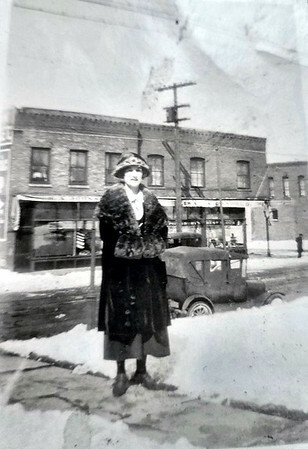 Comments posted with photo 2017.jul.07 by Bill Finlayson :: ""My Grandmother 1920's, standing near the front steps of her home on Glenwood & Morgan. Structures in the background still there today."" - - ""My Grandmother pictured worked in the Bakery that was in the building across the street."" - - ""I use to say it was Minneapolis' first mall. The Grocery, Bakery, and Meat Market were all connected without having to go outside."" Comment posted by Mark Lahtinen :: "" NW corner of Glenwood and Morgan in the back ground ""
Comment by Daryl Vernier :: ""That corner became Pinks store in later years."" Comment by Duane Eggert :: ""Pinks glenwood bakery and joes meat market""
Comment by Diane Devine Hitchcock :: ""Yes Pinks! And Rackners was on Glenwood and Newton. Lived on 3rd and Newton so went there for penny candy etc. Mom sent me there for a gallon of milk once and dropped it in the way home. In glass bottles then. Oops."" Comment by Phillip W. Pederson Jr. :: ""I knew Mr & Mrs Pink. I was hit by a car in front of their store about 1967""
Comments by Duane Eggert :: ""Pinks first name was Saul they lived st. Louis Park"" - - ""Then there was a small building on attached to the other building and are used to fix shoes and it seems to me that was a candy store there too""
Comment by Bill Finlayson :: ""it was ... Gandrud's Grocery in1959."" Comment by Murph Troswick :: ""Lloyd Swanson, who graduated North 1946, described living at Morgan and 5th, and his first job was delivering groceries for Grandrud's Grocery in 1944.""